Modi asked to clarify: Why is the Government of India seeking to "dilute" national rural jobs scheme? 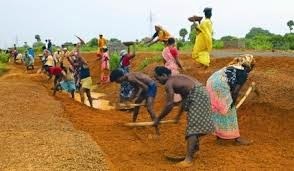 In an open letter to Prime Minister Narendra Modi, several top intellectuals and activists have strongly objected to the efforts to dilute the Mahatma Gandhi National Rural Employment Guarantee Scheme (MGNREGS), saying he should immediate intervene in the matter and the stop the move. Pointing towards several disturbing “impending moves” towards diluting MGNRGS, they said, any such effort would undermine the “support” being extended to the rural poor. In fact, according to them, any such dilution would mean setback “to crores of vulnerable rural families”. Among those who have signed the letter include former member of the National Advisory Council under Sonia Gandhi Aruna Roy, who is with the Mazdoor Kisan Shakti Sangathan; Prof Jean Dreze, a close associate of Nobel laureate economist Prof Amartya Sen, and is currently visiting faculty at Ranchi University; Annie Raja of the National Federation of Indian Women; Prof Jayati Ghosh of the Jawaharlal Nehru University; bureaucrat-turned-activist Harsh Mander, who is now special commissioner to the Supreme Court; Ashish Ranjan of the National Alliance for People’s Movements, and others. In their representation, they said, “We write this letter to seek your immediate assurance that these retrograde, anti-poor and anti-labour measures will be withdrawn, and that every attempt will be made by your government to implement the MGNREGS in its true spirit.” Especially referring to a recent public statement of Nitin Gadkari, Union Minister of Rural Development, and other available information, they pointed towards several major changes being contemplated by the Government of India. Restriction of MGNREGS to tribal/backward districts of the country through an amendment to the Act. Reduction of the minimum labour-material ratio from the current level of 60:40 to 51:49. Severely restricting the MGNREGS through a budget squeeze. The letter strongly objected to the fact that the changes are being “undertaken without any public consultation.” It said, “The MGNREGS was passed unanimously by all parties and all members of Parliament. We fundamentally object to this critical social legislation being undermined through casual use of executive powers and even a parliamentary majority.” Calling the whole exercise “illegal and unwarranted”, the letter added, any budget squeeze on MGNRGS will lead to “employment rationing and acute delays in wage payments”. Insisting that the MGNREGs budget should be “based on work demand, keeping with the spirit of the act, without any discretionary cuts”, the letter concluded, “We wish to convey our resolve to work together to protect the MGNREGS and defend the rights of MGNREGS workers.” It may be noted that several pro-Modi economists, before he came to power, called MGNREGS wasteful expenditure, saying, “huge resources are being devoted to sustain" this other such social programmes, and these should be stopped (click HERE). Meanwhile, quoting documents obtained under the Right to Information (RTI), reports say, government officials have suggested in their file notings Gadkari's announcements run contrary to the “spirit of the Act“ and that reducing the wage component of the total funds allocated for the scheme would lead to a 40 per cent fall in jobs, affecting five crore rural households. Gadkari, on his part, believes that reducing the wage component “is reflective of the view of the legislature“ and should be “brought about immediately“.